47 pages! 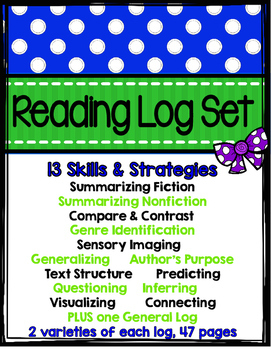 These reading logs support comprehension during shared reading, guided reading, literacy centers, reader's workshop, and reading homework. 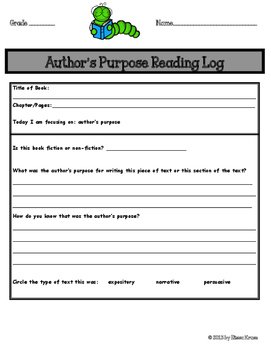 These logs encourage students to THINK while they read (before, during, and after), which translates into comprehension. Use these to introduce reading strategies, practice using them, or to review. 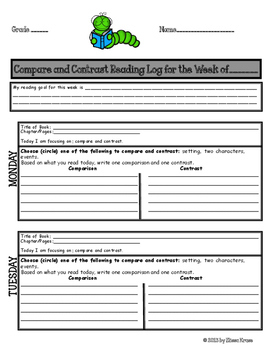 After students learn different reading skills and strategies, they can use these logs to respond during independent reading time, reader’s workshop, shared reading, guided reading, or as homework. They could also be used as literacy center slips. These logs hold students accountable during their reading and encourage them to use these skills and strategies on their own. There is also a general log, with no specific skill or strategy to focus on. You can write your own specific information in. This can allow you to use the same format of these logs and focus on some other specific skill or strategy that you'd like your students to practice. It can also just be a place for them to free write or to choose their own strategy to focus on. The list of strategies and skills is below. I created two different styles/layouts depending on how you want to use them or depending on what's easier for your students. The first version has sections for daily entries. If you copy the logs two-sided, you can fit all five days/sections on one page. They are labeled according to the day of the week so that students can work on the same strategy all week long during reader's workshop, independent reading, centers, or even during shared reading. If you don't want them as a weekly log, that part can easily be cut off since the days of the week are listed vertically along the left side of the page. The second version just has one section per page with more space between lines. 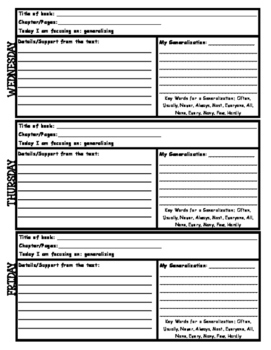 They can be used in lots of other ways too: daily reading homework response log, literacy center log (cut into smaller strips), or exit slips. There is a teacher information sheet included that explains how the logs are set up and how they can be used.